How do you declare your undying love for science? How do you immortalize your doctoral dissertation? How can you let the world know about your eternal love affair with tardigrades, Euler’s Identity, caffeine, or the voyager spacecraft? 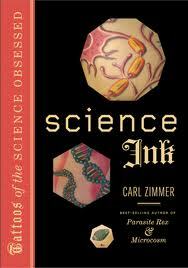 If you answered any of these with “get a tattoo!” than you’ve probably already heard about Science Ink: Tattoo’s of the Science Obsessed, by Carl Zimmer. Over the last several years, Zimmer has been compiling scientists’ tattoos at the Science Tattoo Emporium, which now contains 255 pieces of ink. In Science Ink, Zimmer has selected the best looking, most memorable tattoos from his online collection and published them in a beautiful book featuring both artwork and insight into each piece. Zimmer is among the best of the “science communicators”, those who distill the essence of important concepts into comprehensible units. Each tattoo come with either a description of the story behind its origin, its meaning to the canvas, or the fundamentals of the concept it represents. The book covers an extensive range of topics, from mathematics to natural history to physics and astronomy. When I first heard about this project, I was expecting a coffee-table style book of tattoo photographs, but it is much more than that. The tattoos are simply prompts for a deeper exploration into the meaning of science to society, as well as a delightful collection of (very) short stories about individuals experience in science. …and that leads into my one major criticism of this collection. Tattoos are artwork. They are often a composite of the tattoo bearer’s vision of what they want and the tattoo artist’s skill, experience, and talent. In Science Ink, there’s a python tattooed on one scientist’s arm that looks like it could be an oil painting. There are murals, mosaics, and incredibly clever and inspired compositions that could just as well be hanging in a gallery as indelibly stamped onto the skin. Yet nowhere in Science Ink are the tattoo artists credited. Yes, tattoos are almost always commissioned works, and the copyright belongs to the bearer of the artwork, not the creator, but given the recent discussion led by Glendon Mellow (who’s ink you can see on page 123) at Symbiartic on properly crediting artists for their work, it seems like a needless oversight to fail to credit the tattoo artists for their contribution to Science Ink. My science tattoo is on page 173 and it was created by William Wood of Dogstar Tattoos in Durham, NC. He did such a good job that I went back to him for my second piece. Overall, this is a great resource and a fun discussion piece that now has a permanent home on my coffee table. Crediting the artists should be a painless as adding an appendix to future printings. A partial list of credits of the tattoo artists represented in Science Ink will be posted to Carl Zimmer’s personal website in a few days. This list of credits will be printed in the book when it goes back to press, which appears to be very soon. It really is a fantastic book, I feel kind of bad for focusing so much on that one oversight. That’s weird, on that list I see the credit for designing Scicurious’s tattoo, but not the credit for designing my own tattoo. I know I had a really hard time tracking down my tattoo artist since the shop closed. There’s lots of lateral movement in that industry, and the informality of first names makes it hard to keep tabs on particular tattoo artists in my experience.